It was hard to pick a favorite city on our trip to Spain with Barcelona, Madrid and San Sebastian all having their own special charm. Barcelona felt the most livable, Madrid the most authentically Spanish and San Sebastian had the best food we’ve ever tasted. Since we were visiting Spain in their off-season we had expected Madrid to be a bit quieter like Barcelona, but boy were we wrong. It seemed like everyone who actually lived in Spain had decided that the holiday season was the perfect time to visit Spain’s capital city. The streets and plazas were constantly packed and it felt much busier and yet less touristy than Barcelona. The city had a certain buzz that I loved and even though the temperatures had started to drop it was still prime weather for people watching, long strolls and eating! I know, I know, we talk about a free walking tour in almost every city we visit but it really is the absolute best introduction to a new city! 95% of the time the tour is led by a native or at least someone who’s been living there for a substantial amount of time and their local knowledge is deeper than your average guidebook. While I tend to do a lot of research in advance of visiting a place, Jeremy usually likes to be surprised and taking a walking tour fills you in on a lot of information and subtleties about a city that you won’t guess unless you do a deep dive into local blogs, etc. We took a two and a half hour tour run by Sandeman’s New Europe Tours that hit most of Madrid’s main tourist sites in the city center. While we didn’t get to go inside any of the sites, our enthusiastic guide gave us a great historical overview and some tips about when to visit. We caught glimpses of the Royal Opera House, The Royal Palace, the worlds oldest restaurant, San Miguel’s Market and learned about the origin of tapas, Queen Isabella, the Spanish Civil War and much more. There are two world-renowned museums in Madrid that everyone will tell you to go to, the Reina Sofia and the Prado Museum. But if you don’t have the time to commit 3 hours plus to explore, it’s probably best to just pick one. Our museum threshold is about two-hours at a time and we’d heard that the Reina Sofia was manageable and had a lot of Dali’s art which Jeremy really wanted to see. Spain’s national museum of 20th century art, the museum has four floors to explore and several unique exhibits and we crammed a lot into our two hour window. The Reina Sofia is a beautiful piece of architecture as well and had a really neat roof that overlooked Madrid’s rooftops. We loved this market so much that we went back twice! They have a large variety of food stalls from classic Spanish cuisine to Thai, burgers and more. It’s definitely not as traditional as the Mercado San Miguel but was filled with more locals than tourists and had three different levels and outdoor seating areas to sip on a Vermouth and just relax after a day of touring. Calle Fuencarrol is the main walking street that runs through the Chueca neighborhood of Madrid. While well-known retailers from all over the world line the walking street, the little side streets are host to little dive bars, restaurants and a variety of cute boutiques. This is also the neighborhood where our favorite market, San Ildefonso is located and an awesome craft brewery we discovered called Fabrica Maravillas. If you’re a fan of Game of Thrones or any other sort of royalty TV or books, then you’ll love the Royal Palace. While no Spanish royals currently live in the palace, it was home to King and Queens from Charles III to Alfonso XIII and was a great way to learn about the history of Spain’s royal families. The palace boasts over 3,000 rooms ornately decorated with beautiful tapestries, gold-lined architecture, and detailed paintings and tableaus from floor to ceilings. In my opinion, there were enough descriptions in each of the rooms to make a self-guided tour the way to go over paying for a guided tour. Directly behind the Royal Palace are the royal gardens, which make for a perfect photo opp. Being there in the fall unfortunately we mostly saw a lot of shrubbery, but I’m sure they are gorgeous in the spring and summer blooming with roses and other sorts of flowers. A short walking distance away is another unique site, Temple De Debod, which is actually an ancient Egyptian temple that was transported to Madrid’s Cuartel de la Montaña Park. The visitor entrance is pretty restricted so instead we did a lap around the temple, which is actually a pretty cool structure and the park was nice to sit in and overlook the neighborhoods. Mercado De San Miguel is Madrid's most well-known and touristy market but it is for a reason, this place is amazing and huge! It was also very overwhelming, especially during dinner and lunch so be prepared to make a decision quickly as you walk along since it might take you a while to make your way back. Filled with different stalls selling meats, cheeses, olives, tapas, pinxtos, candy, baked goods and just about anything else Spanish food-related you can imagine this place is a foodies dream. The market was also completely indoors which make it a great rainy day destination to hole up for a bit for a bite and a drink. Which in my opinion, is the best way to pass the time in Spain no matter the weather. 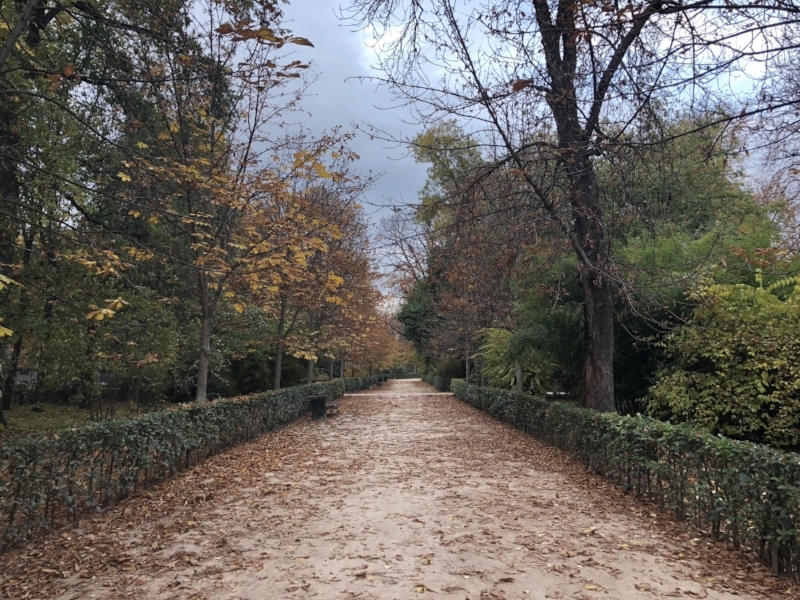 Called the “green lung” of the city, Retiro Park is over 300 acres and over 15,000 trees. The park is also home to several architectural and historical elements such as a large lake, which you can rent a rowboat on and the Velazquez and Glass Palaces that are often used as exhibition halls. The Glass Palace is probably the parks most famous structure and was originally used to house a collection of exotic plants for the Philippine Exhibition of 1887. Directly north of Retiro Park is the Salamanca neighborhood of Madrid. This area reminded us of the Gold Coast of Chicago with several restaurants offering fancy brunches. While they all looked tasty, they didn’t seem particularly local and instead we decided to pop into an upscale bodega to grab a loaf of bread and some jamon for a picnic to eat in the park. 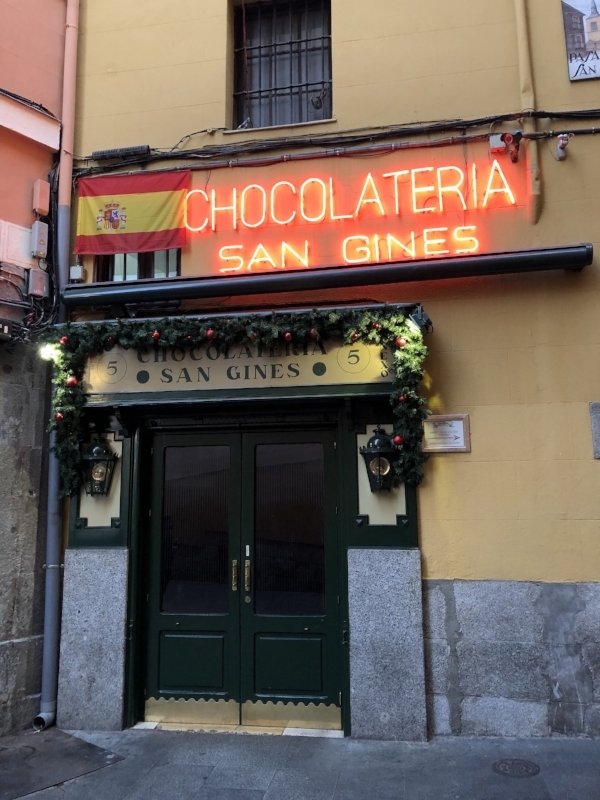 You can’t go to Spain without having churros, and if you’re in Madrid the place to go is Chocolateria San Gines. 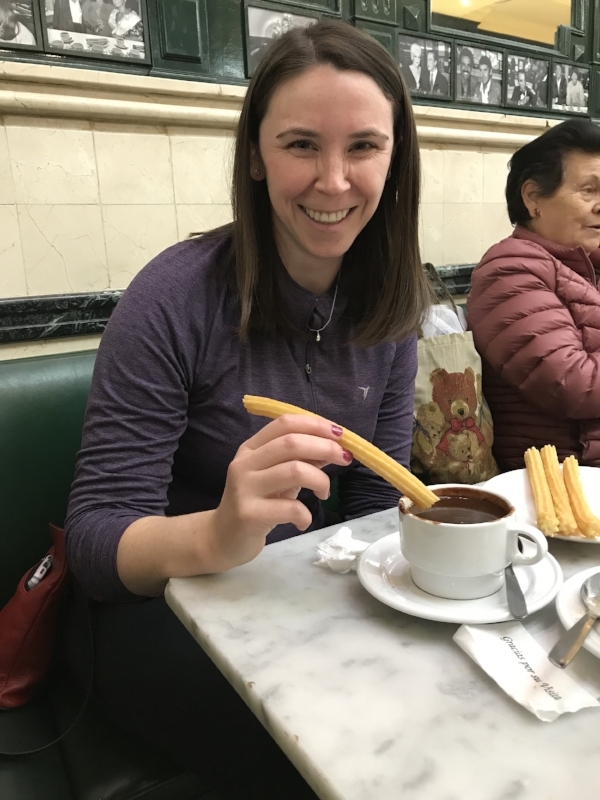 We arrived among a throng of Asian tourists and in true Chinese-style we fought our way to the front of the line to secure our creamy hot chocolate and crispy cinnamon-sugar churros. I’m not a huge chocolate lover, but this sweet treat was certainly worth the push and shove. One of Jeremy’s coworkers suggested two different restaurants on Calle Caja Baja in the La Latina neighborhood for dinner and we quickly discovered that this area was a goldmine of great places to eat and drink. One of the things I wanted to try most in Spain was gazpacho, but because it wasn’t prime tomato season I had a really hard time finding the dish. Luckily for me one of the little bars on Calle Caja Baja had Gazpacho, making it my new favorite neighborhood. If you happen to be in Madrid make sure you don’t miss these two amazing restaurants, Lamiak and Juana La Loca. Many people think of Paris when it comes to a European city famous for cheese and wine, and I’m here to say that Madrid should not be overlooked. I was getting close to hangry and we wandered into this little café after a day of walking. The weather was just starting to dip into the low fifties and the inside was warm and cozy and the walls were lined floor to ceiling with reasonably priced bottles of wine from all over Spain. We chose to start off with a sweet Vermouth followed by a glass of smooth tempranillo (red wine) paired with an aged Manchego with quince and goat cheese spread on toasty bread and drizzled with honey. Sitting here in this little café sipping wine and nibbling on cheese may have been one of my most happy moments in Madrid.